Keep in mind that smoothies are #food, and 500 calories is as large as most meals. A smoothie is filling, but you need to decide if you’re consuming it as a meal replacement or simply as a drink with your burger and fries. Also, try the new #Diet Pepsi Slurpee — it’s virtually calorie-free! In terms of calories, the pretzels win hands-down. 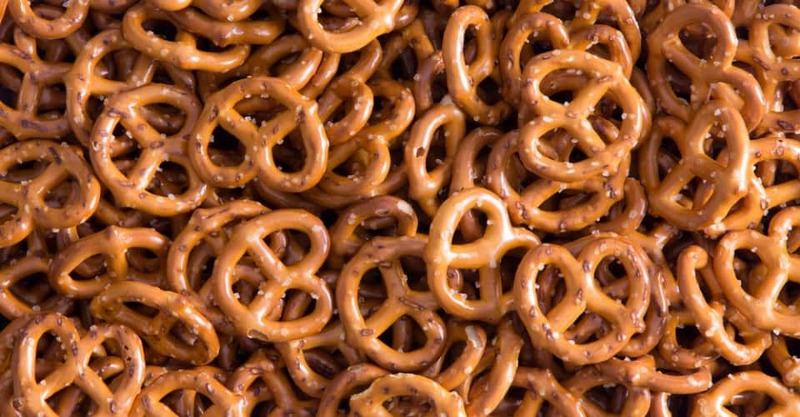 An ounce of pretzels (110 calories) contains 60 fewer calories than an ounce of peanuts (170 calories); however, pretzels are a refined carbohydrate. If you are going to snack anyway, you may as well get the most out of your foods. Pretzels may be low in fat, but they are “empty calories.” Peanuts, on the other hand, offer nutrients such as heart-healthy monounsaturated fat, fiber (which makes you feel full faster), protein, and other essential vitamins and minerals — just eat half an ounce instead of an entire ounce. You would think that the egg would throw the English muffin out of the game, but that’s not the case. Not only are bagels typically larger than English muffins, but that butter — well, if it’s put on at the bakery or deli, watch out! It could pack on an extra 300 calories (just three tablespoons). With an English muffin, you can use the calories saved on the bread to add an egg, which has plenty of protein and makes for a more balanced meal. Plus, you will probably feel full longer after #eating the egg sandwich than you would after eating a bagel. If you’re really ambitious, skip both and go for whole wheat toast with a couple of egg whites — that’ll save you some real calories, and you get the fiber from the whole wheat toast. For some reason, whenever I hear the word bran muffin, I just think it’s a better choice. Bran sounds so good for you. The reality is that bran muffins are much larger and have more calories than a donut. While one Dunkin’ Donuts glazed donut has 180 calories, 8g fat, 25g carbs and 1g fiber, an Au Bon Pain Raisin Bran Muffin has 520 calories, 15g fat, 97g carbs, and 10g fiber. Does the raisin bran muffin offer more nutritional value? Well, it does have more fiber, but that’s about it. The additional fat and calories are not worth it — you can get fiber from better places. Tuna salad can be a tasty and nutritious sandwich — but not the way most delis make it — with tons of mayonnaise! Mayonnaise adds lots of fat and calories (about 200 calories for two tablespoons) to an otherwise heart-healthy, diet-friendly choice. At the deli, opt for lean cold cuts such as roast beef, turkey and ham, and go easy on the cheese and mayo (try mustard instead). You would think that the grilled chicken would be a better choice since the fish is deep-fried. In reality, it’s a toss up — both are high in calories, fat, and carbohydrates. The Filet-O-Fish has 410 calories, 20g fat, and 41g carbs, while the McGrill contains 410 calories, 17g fat, and 39g carbs. You’d be better off with a plain old hamburger at 280 calories, 10g fat, and 36g carbs. Or even better, how about just having the McGrill without mayonnaise or the bun? With about 121 calories, little fat, and few carbs — it’s a pretty good deal. Ordering a chef salad is usually your best bet of these three, but it varies depending on the amount of bacon, ham, cheese and dressing. (e.g., replacing the ham, bacon, and cheese with turkey or grilled chicken transforms this into a healthy salad). At Au Bon Pain, the Chef Salad is 290 calories, compared to 310 for the Chicken Caesar and a whopping 460 calories for the Cobb (try replacing the regular bacon with Canadian bacon or ham). At Blimpie, you can get the Chef Salad for only 212 calories, and at Cousins Subs, it’s only 192 calories. The unfortunate part is that the dressing is NOT included in these calorie totals. Always order the dressing on the side, and sprinkle it on with a fork — yes, a fork. Choose your dressing wisely. Also, skip the croutons.